Tindaris, Cefalu Private Tours from Messina Include: Our private tour include private transportation to and from Messina with English speaking driver/guide, taxes, parking, tolls. Your first stop on this beautiful shore excursion is Tindaris, a Bronze Age settlement from about 1500 BC. The most important Greek city in this vicinity, Tindaris suffered from a landslide at the end of the First Century AD and an earthquake in 365 AD. Most of what the visitor sees today was constructed during the Roman period. You will tour the amphitheatre, built in the 4th century BC, with its ruins of simple temples and the so-called basilica, a fine example of Greco-Roman architecture. You will also see an important Christian sanctuary that sits high above the city, with a black Madonna statue that draws visitors from near and far. 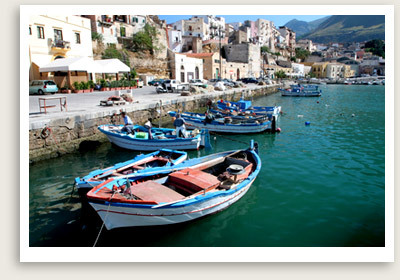 Then your private tour proceeds to Cefalù, a charming village with winding, medieval streets and delightful restaurants overlooking the rocky coast. It is dominated by a huge rock known as La Rocca, once the site of a Temple of Diane and one of the finest Norman-Arab-Byzantine Cathedrals. In 1131 the ambitious Roger II began the Duomo of Cefalù, intended as Sicily’s religious seat. Though it failed to fulfill this function, the building’s magnificence has never been eclipsed. Its fine mosaics, including a depiction of Christ Pantocrator in the apse, are often celebrated as the purest Byzantine works of art on Sicilian soil. Also of interest is the Mandralisca museum, which houses an Antonello da Messina painting, in addition to an eclectic collection of coins, ceramics, vases, minerals and shells from the area. Time permitting, you will drive a little further along the coast line to reach the charming village of Santo Stefano di Camastra and browse the colored pottery in its many ceramic shops.